When the time comes to serve real ale, the cask has to be fitted with a dispensing device. Depending on where the cask is kept at the pub, it may be fitted with a simple tap or a beer line to draw the beer through a beer engine. A beer engine is a manual device used to siphon beer from a cask. Because it requires a bartender to literally pull the beer through the beer line, beer engines are also referred to as handpulls. 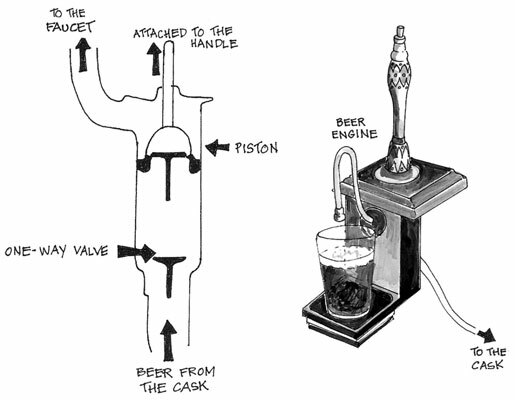 The mechanics of a beer engine are quite simple. The airtight piston chamber is at the heart of it all. When the bartender pulls the beer engine handle, beer is drawn from the cask into the piston (it may take several pulls, depending on how long the beer line is). A one-way valve holds the beer within the piston. When the bartender pulls the handle again, the beer in the piston flows out through another one-way valve and to the beer engine’s tap as more beer is drawn to fill the void in the piston chamber. The typical beer engine can draw about half a pint of beer with each pull of the handle, so a good, strong, and efficient bartender should be able to fill your pint glass with two full draws. Make sure the glassware is beer clean — the highest degree of glassware cleanliness. Make a smooth and even draw on the handle. Wait several seconds to allow the head to rise and begin to fall a bit before starting the second draw. Make sure the customer gets a full measure of beer — that is, fill the glass up to the top with minimal head. The well-poured pint has a head that rises just above the rim of the glass, which is referred to as just proud of the rim. Presentation, for all its pleasant visuals, is all for naught if the beer itself isn’t in palatable condition. The beer line and the piston chamber in the beer engine continue to hold beer between draws. This beer goes stale when left overnight, so it’s of utmost importance that the bartender pours the first pint or two drawn the next day down the drain and not serve stale beer to an unsuspecting customer. Having a classic pub setup for your real ale just isn’t feasible for some times, locations, and events, such as when you don’t have a downstairs cellar or a bar top to affix the beer engine to. Or maybe you have only a single cask of a special, one-time-only guest beer available to serve. For these situations, simple gravity dispense works best. Gravity dispense, or gravity pour, is all about letting Mother Nature do the work for you. By simply fitting the cask with a spigot and a soft spile, you can draw beer rather quickly and easily. No pushing, no pulling, no gas — of the inert type, anyway. Because gravity dispense requires very little setup or take-down, most beer festivals that feature real ale favor this method of pouring.